I saw this recipe last year and wanted to try it. Only problem, it was the "off" season for fresh cranberries. Solved that problem by buying extra bags this past holiday season and putting them in the freezer. And this recipe is definitely worth having cranberries on hand. 1. In a small bowl stir together pepper and celery salt; rub onto both side of chops. In a medium skillet heat oil over medium-high heat. Cook pork chops and onion rings in hot oil until chops are browned, turning once. Carefully add the 2 tablespoons water to skillet. Cover and cook over medium heat for 15 to 20 minutes more or until juices run clear (160º). Transfer chops to serving plate; keep warm. Remove onions from juices with a slotted spoon. Set aside. 2. Meanwhile, for the sauce, in a medium saucepan combine cranberries, sugar, the 3 tablespoons water, the orange juice concentrate, orange peel, sage, and salt. Cook and stir over medium heat about 10 minutes or until the cranberry skins pop and mixture thickens. Stir in the onions; heat through. 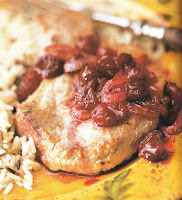 Serve sauce with pork chops. Didn't have celery salt so substituted with regular salt. While I was getting the ingredients together for the pork rub, I went ahead and put together the ingredients for the cranberries. So when it came time to prepare them, all I had to do was turn the burner on. Next time I would definitely cut the amount of pepper to an 1/8 teaspoon so it's not so strong. Didn't have sage, and honestly with how strong the pepper was, I'm not sure you would have been able to taste it. The adjustment in pepper aside, this is definitely a nice change for preparing pork chops.